Your February selection includes a new Walter Brueggemann title on hymn singing, Nadia Bolz-Weber’s book calling for a sexual reformation, and books about ministry, grief, depression and anxiety. 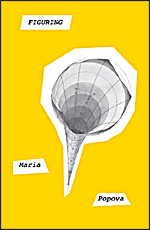 Maria Popova (creator of the Brain Pickings blog) ponders love and finding meaning in life in Figuring. 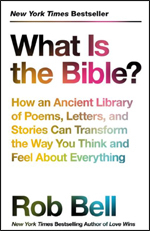 And Rob Bell’s What Is the Bible? is now out in paperback. 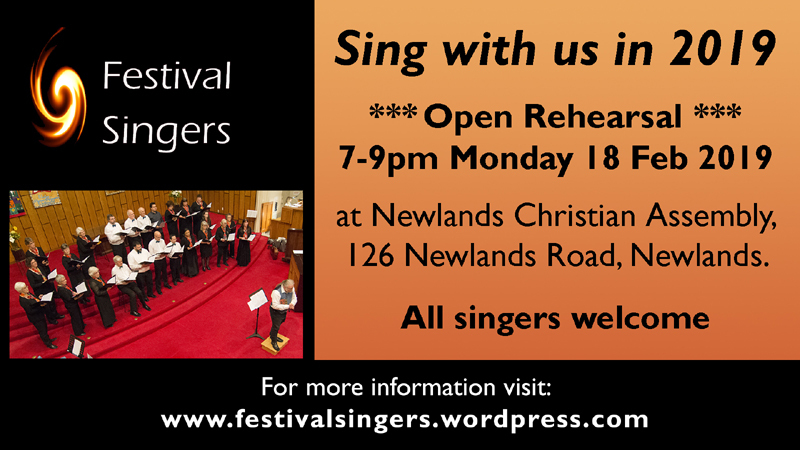 Why and What We Sing. 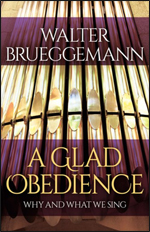 In this helpful and engaging volume, Brueggemann discusses both why we sing and what we sing. The Christian practice of hymn singing, says renowned biblical scholar Walter Brueggemann, is a countercultural act. It marks the Christian community as different from an unforgiving and often ungrateful culture. It is also, he adds, an “absurd enterprise” in the midst of the hyper-busy, market-driven society that surrounds us. The first part of the book examines the Psalms and what they can teach us about the reasons that corporate song is a part of the Christian tradition. The second part looks at fifteen popular hymns, including classic and contemporary ones such as “Blest Be the Ties That Binds,” “God’s Eye Is on the Sparrow,” “Once to Every Man and Nation,” “Someone Asked the Question,” and “We Are Marching in the Light of God,” and the reasons why they have caught our imagination. 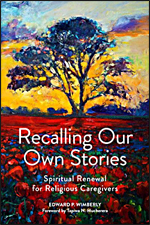 This book tells of the author’s return to a prayer/devotions practice as she shares her own very naked, very funny, very touching prayers and reflections. The book also shares Joyce’s personal history of bumps and bruises both in her life and in her spiritual growth. This is not a didactic book. The author has no answers for others but shares how and why she prays. 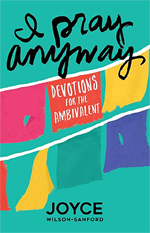 Her inclusive approach, practical voice and humorous compassion welcome anyone wanting to have their own devotional practice beyond their own ambivalence – to pray anyway. Joyce speaks the language of the spiritually independent and articulates the ambivalence of the growing group who are religiously disenfranchised. Joyce’s life has had its share of profound challenges and she has gone through many permutations of devotional practices –including having none – and now has emerged with a very real engaging wisdom that she shares in this book. “Nadia has an amazingly faith-filled way to say good things in a hard way and hard things in a good way. She does it again with one of our most wounding, dangerous, and needed subjects – Christian gender and sexual teaching! This will heal many.” Richard Rohr, O.F.M. Written by the staff and dedicated lay members of the St Martin’s community, this book is an invitation to us all to be more inclusive and compassionate when planning worship and other services. Topics include pastoral care for those affected by crime and homelessness, great sacred music, laying-on-of-hands, podcasting/webcasting, and holiday observances that extend love and service to all neighbours across denominations and walks of life. It explores questions of both formal and informal engagement with liturgy, prayer book revision, and practical how-tos for acute congregational needs. Urban parishes will find inspiration and resources within these pages. Hearing and Responding to God’s Voice. This six session study course explores how God calls us to a life that we could never imagine on our own. Throughout the Bible, God interrupts the lives of ordinary men and women, calling and empowering them to lives of service they never could have imagined on their own! Discover how to hear and respond to the unique call God is placing on your life through the stories of ordinary people found in the Bible. Called will examine the lives of the Abraham, Samuel, Esther and Mary Magdalene, Jonah, and the beloved disciple. Hearing and Responding to God’s Voice. Susan Robb. The six-session DVD features Susan Robb guiding participants through the study. The video sessions are 10-12 minutes long and, when combined with the six book chapters, make an ideal six-week group study. A 9-Day Novena to Mother Teresa, Saint of the Gutters. Through this novena of prayer, our faith is energised as we “sit at St. Teresa of Calcutta’s feet” to learn lessons of love, and invoke her intercession for our urgent, as well as our lesser needs – big and small. She will help! However, this petite woman’s “yes” to God truly changed the world forever. She opened the world’s eyes to our duties to feed the hungry and clothe the naked and told us that a far worse hunger exists in our Western world. 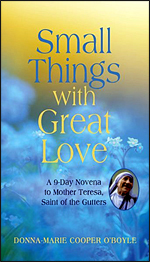 She continues to encourage us to reach out in love to those in need. Spiritual Renewal for Religious Caregivers. 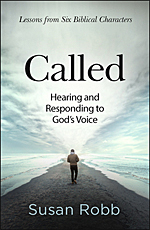 This book offers a way to renew your motivation for ministry by reconnecting to your original call, visualising again how God has acted and remains intricately involved in our lives. Wimberly demonstrates how religious caregivers, often facing burnout, can tap the sources of renewal that reside in the faith community. Wimberly enables caregivers to map out and come to grips with cultural expectations of their profession. He also helps readers explore and edit the mythologies that make up their self-image, attitudes toward others, expectations about their performance and role, and convictions about ministry. Popova explores the complexities of love and the human search for truth and meaning through the interconnected lives of several historical figures across four centuries – beginning with the astronomer Johannes Kepler, who discovered the laws of planetary motion, and ending with the marine biologist and author Rachel Carson, who catalysed the environmental movement. Stretching between these figures is a cast of artists, writers, and scientists – mostly women, mostly queer – whose public contribution has risen out of their unclassifiable and often heart-breaking private relationships to change the way we understand, experience, and appreciate the universe. (Out of the Depths series). 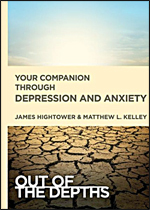 The Out of the Depths series addresses common pastoral crises in a faithful, encouraging, and factual way that provides support to parishioners in crisis beyond the initial pastoral conversation. These booklets are essential care resources to be given out by pastors and pastoral care teams. Each booklet begins with a thoughtful consideration of the topic at hand, which is followed up by 30 brief devotions. These devotions are designed to be manageable in an overwhelming time, encouraging, and honest. The books include accessible material describing the dynamics of the crisis situation and typical reactions, which provides the reader with a sense of grounding and direction through increased knowledge. Harriet Bryan; James E Hightower. Picking Up the Pieces to Become Whole Again. 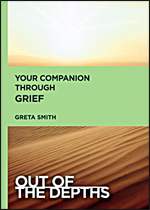 This practical guide helps readers work through their grief through expressive therapies and activities, based on the techniques Coenen honed as a professional counsellor after the unexpected loss of her husband. 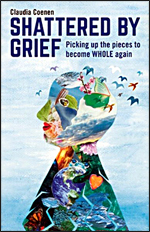 She provides clear methods to process grief, experience its pain and learn how to live fully again. Readers are encouraged to completely engage with their grief through storytelling, self-care and ritual, and honest reflection. 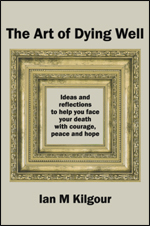 The book navigates readers through the healing process while allowing them the freedom to explore their pain in a way that best fits their unique situation. Rejecting the idea of a ‘quick-fix’ to grief, it suggests ways in which tragedy and loss can be a springboard for rejuvenation and transformation. Sue Knowles; Bridie Gallagher; Phoebe McEwen. By helping young people with anxiety learn to recognise and manage their symptoms, this anxiety survival guide teaches 12 to 18 year olds how they can overcome their biggest worries. Co-written with a college student who has experienced anxiety herself, it is a relatable and straightforward guide. As well as providing tried-and-tested advice and exercises that are proven to reduce feelings of anxiety, it includes recovery stories from young people who have managed their symptoms successfully. 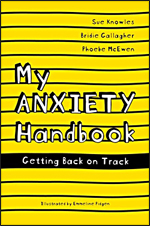 By showing that anxiety is a normal human emotion that many people face, this book helps young people understand the ins and outs of their own anxiety and helps them to challenge the difficult patterns they may get into. Practical chapters on sleep, exam stress, transitions, and seeking extra help, make is a go-to guide for any tween, teen or young person living with anxiety. 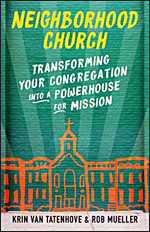 Transforming Your Congregation into a Powerhouse for Mission. How can we embody the values of love, grace, and justice? As faith communities, how can our collective embodiment of these values shine even brighter? The answers to these questions must always unfold right here, right now, exactly where God has planted us. This book will inspire churches to become vibrant and engaging community partners with the families and neighbourhoods living around them. The authors give practical, essential tools that lead to communal conversion, develop the DNA of listening, spur fruitful partnerships, promote integrated space, and sustain long-term visions. They believe these tools will spark true revival and unleash the power of incarnational ministry. 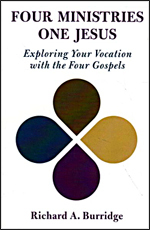 Exploring Your Vocation with the Four Gospels. Combining the skills of a leading biblical scholar with the wisdom derived from years spent training candidates for ordination, Burridge offers rich reflections on the four gospel portraits of Jesus and shows how they not only inform the calling to ordained ministry but also help sustain the practice of Christian ministry in its various dimensions. This book is for all who feel called to a life of Christian ministry and want to ground their calling in the teaching and example of Jesus, as provided in the four gospels. 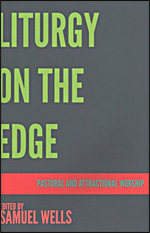 Burridge helps readers consider vital questions such as: how to sustain reading, Bible study, and theological reflection in ministry; how to extend pastoral care to people outside as well as inside the Christian community; how to care for self and family; and how to stay attuned to the Spirit by cultivating a fresh and vigorous life of prayer. 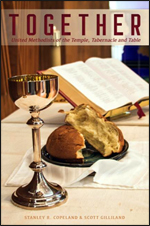 United Methodists of the Temple, Tabernacle, and Table. Stanley R Copeland; Scott Gilliland. 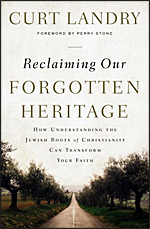 How Understanding the Jewish Roots of Christianity Can Transform Your Faith. Rabbi Landry reveals how understanding the Jewish roots of Christianity leads to a more vibrant, secure, and powerful Christian walk. The church was created by Jesus, who was born Jewish yet primarily rejected by his family and his people. His early followers were both Jewish and gentile, and the church’s early culture was rooted in Judaism and a Jewish understanding of God’s relationship to his people. Over time, however, Christianity became increasingly more Roman than Jewish, and the church lost its identity. Rabbi Curt Landry’s personal story is remarkably similar. Born out of wedlock to a Jewish mother and a Catholic father, Landry was put up for adoption. For over thirty years, he had no understanding of his heritage, his roots, or who his parents were. But when he discovered the truth of his story, his life changed completely. Bell takes us deep into Bible passages to reveal the humanity behind them. You can’t get to the holy without going through the human. What does this passage / story / poem / verse / book tell us about how people understood who they were and who God was at that time? In asking these questions, Bell goes beyond the one-dimensional question of “is it true?” to reveal the Bible’s authentic transformative power. 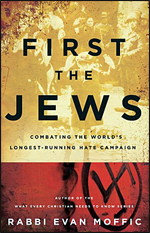 Combating the World’s Longest-Running Hate Campaign. Focusing on the events since September 11, 2001, Rabbi Evan Moffic considers the 21st century anti-Semitism and the historical pattern of discrimination to other groups that often follows new waves of discrimination against Jewish communities. With a hopeful and collaborative tone, he suggests actions for all people of faith to combat words and actions of hate while lifting up practical ways Christians and Jews can work together. How to Believe in God and Love After Tragedy, Abuse, and Other Evils. Most people think God can overcome evil singlehandedly. Oord says God needs co-operation for love to reign now and later. This leads to a better view of the afterlife he calls, “relentless love.” It rejects traditional ideas of heaven, hell, and annihilation. Relentless love holds to the possibility all creatures and all creation will respond to God’s love. 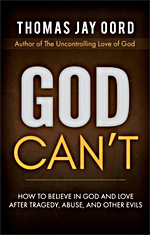 God Can’t is written in understandable language. Thomas Jay Oord status as a world-renown theologian brings credibility to the book’s radical ideas. He explains these ideas through stories, illustrations, and scripture. Great News for Believers Who Are Introverts, Spiritual Strugglers, or Just Feel Like They’re Missing Something. This book is good news for people who are desperately looking for it. It’s also for those who want to believe in Jesus, but inwardly fear that they don’t belong, worry that don’t have the requisite emotion-based relationship with God, and are starving for good news. Is depression a sure sign of a lack of faith? 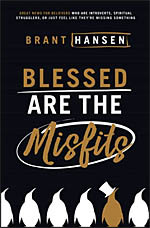 Blessed Are the Misfits is going to generate discussion, and lots of it. It’s simultaneously highly provocative and humbly personal. It’s also leavened with a distinct, dry, self-effacing humour that is a hallmark of Hansen’s on-air, writing, and public speaking style.